Research with fathers enrolled in fatherhood programs is often limited to measuring the amount of child involvement, since there are few existing quality measures that have been rigorously tested for use with low-income, nonresident fathers who are primarily unmarried. 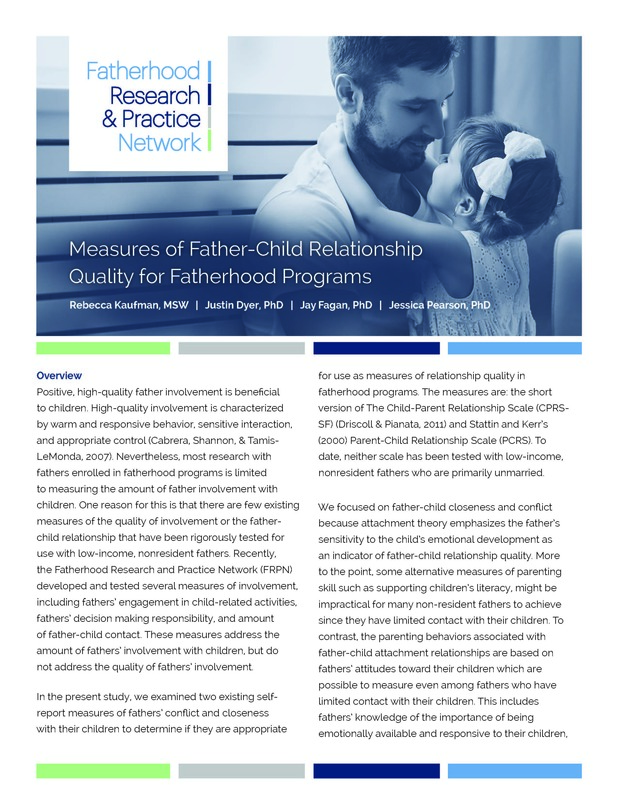 In this FRPN research brief we examined two short measures assessing the quality of father-child relationships to determine what measures are most appropriate for use in fatherhood programs. Kaufman, R., Dyer, J., Fagan, J. & Pearson, J. (2016). Measure of Father-Child Relationship Quality. http://www.frpn.org/asset/frpn-research-brief-measures-father-child-relationship-quality.